Images from Nerf this morning; high-res shots of the Nerf Vortex Diatron and Nerf N-Strike Elite Roughcut 2x4. There are already tons of videos out there from folks who got Roughcuts early due to stores putting them out ahead of release dates, so there's plenty of info out there on that. The Nerf Diatron however, has maintained some semblance of secrecy. Who knows if it'll pop ahead of Spring 2013, but I wouldn't be surprised. The Roughtcut for those who don't know, is an eight-shot, slam-fire capable, pump-action blaster with Elite ranges. It also fires two darts at a time, making it the closest approximation to a shotgun-spread blaster that anyone has made in a long time (the Triple Shot DOES NOT COUNT. It was good modded, but the stock shotgun spread on that thing was terrible). Either way, it looks interesting and I can't wait to get my hands on it. None of the stores in my area have it on shelves, so I would need to order via Amazon. 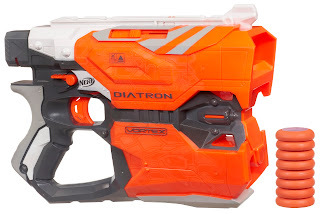 The Nerf Vortex Diatron, that's a whole 'nother story. It looks remarkably like a Plasma Cutter from Dead Space (bonus) and fires two discs at once (double-bonus!). 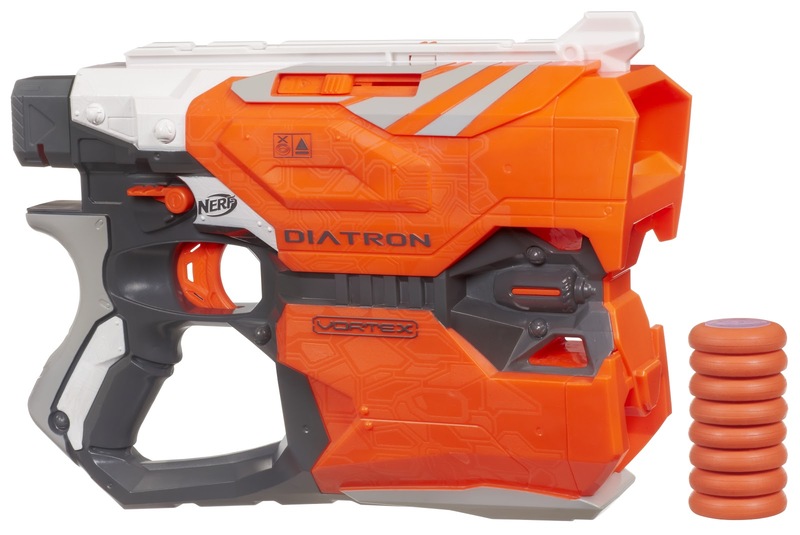 It looks like a doubled up Nerf Vortex Vigilon, so I'm guessing the capacity is ten discs per reload. (11 or 12, depending on how you load it, amirite guys?) I do wonder if the discs will collide with each other at some point in mid-air during flight, so it'll be interesting to see how this fires. Of all the recent blasters, this one is the only one not seen on shelves yet. Yet. In any event, these two blasters have the "multishot madness" tagline on their boxes so Nerf is definitely leaning towards a different type of functionality, seeing as how they've increased ranges using Vortex and Elite styles. Make sure to check the Nerf Facebook page (linked at the beginning of this post) for further info such as pricing and alleged availability. And naturally, once I get my samples in I'll have my reviews up as usual. Although at the rate things are going, who knows what'll even be left by then!